Your spacious Wilds of Michigan cabin welcomes you into the warm living room featuring an exceptional view of Lake Superior and all the comforts of home. 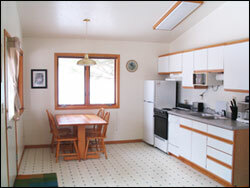 Enjoy the view from your fully equipped kitchen as you prepare your gourmet meals or a snack for the hike. 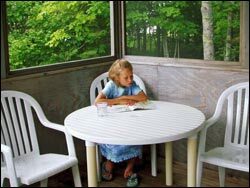 Listen to the waves while dining in the screen porch or BBQ right from your deck. Have a picnic on the beach just steps from your door. 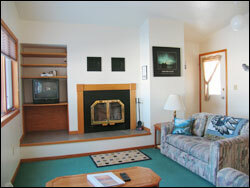 Two bedrooms easily accommodate your needs. Each has a queen sized bed in one room and either two twins or a queen in the second. 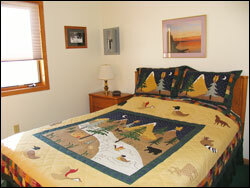 And each can host up to six people by utilizing the queen size sofa sleeper. All linens are provided. 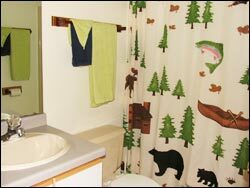 Your full bath offers hot steamy showers for your return from a long day in the wilderness. Bath towels are provided. 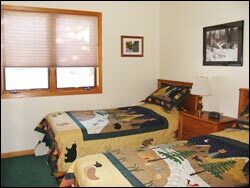 Mountain View Lodges also has one wheelchair accessible cabin. Our property is maintained with tender loving care and attention to every detail. We continually look for ways to make your experience the best it can be! Our closest grocery and gas station are 10-15 miles east. So, we recommend you fuel up and pick up your milk, eggs, etc. enroute.